Every Note Played follows Lisa Genova’s usual pattern of introducing the reader to a character who has just been diagnosed with a terminal illness (or is about to be) then follows them through their daily life until they die. I’m not sure why I read her books, especially since I am not at all medically-minded, can’t stand the sight of band-aids and would rather clean the bathroom than accidentally see blood, guts or body parts on one of those medical emergency shows on television. Despite my aversion to the medical nature of Lisa Genova’s plots, I read Every Note Played whose main character, Richard, develops ALS. Richard is a middle-aged concert pianist who first notices a tremor in his right hand. Bit by bit, his entire right arm becomes paralysed, then his left arm. Richard’s ex-wife, Karina, eventually takes Richard back into their old family home and cares for him until his death. Richard and Karina’s relationship was complicated. They divorced because he played around. She blamed him for ruining her career as a jazz pianist, while he blamed her for not wanting more children than the one daughter they had. Their relationship should have been more interesting than it was portrayed, but I think Lisa Genova is better at describing how an illness manifests than she is at developing her character’s personalities and personal growth. It didn’t help that Richard was a selfish git and Karina was self-pitying martyr. I was confused about what ALS was until I realised that in Australia, ALS is known as motor neuron disease. In other parts of the world, ALS is called Lou Gehrig’s disease. Lisa Genova does a great job of teaching readers about the diseases she uses in her fiction, but I doubt that anybody who had one of these diseases would want to read her stories. The characters usually come to terms with the issues in their relationships before their end comes but the medical side of this story is stronger than the characters development. Lisa Genova has a distinct story-telling style. Pick a horrible disease, preferably something untreatable and fatal. Introduce a lovely character who is an asset to their family and community, make the reader care about the character’s fate and then boom! Give the character the disease and allow the readers to learn about it as the character does. Leave readers sobbing as the character realises how grateful they are to be alive at all, and how blessed they are to have their family and friends. Inside the O’Briens follows the formula. The O’Brien’s are an Irish Catholic family living in Boston. Joe O’Brien is in his forties and happily married to Rosie. They have four grown up children and a dog. Joe is a police officer, who, along with his workmates, is jittery after the Boston Marathon bombing. The whole family religiously follow the Red Sox baseball team. Joe’s temper occasionally flares up and he is clumsy. Rosie gets fed up with him breaking things around the house and when she notices him wriggling constantly, she forces him to visit a doctor. Joe is diagnosed with Huntington’s Disease. motor, cognitive, and psychiatric symptoms that typically begin at age 35-45 and advance relentlessly until death. There is currently no cure or treatment that can halt, slow, or reverse the disease’s progression. Most of the story follows Joe’s day to day life. He chooses to work until he is no longer physically able to manage, but unfortunately, when he does have to retire it is before he is financially ready. Early retirement affects Joe’s pension and Joe and Rosie are advised to take measures they find abhorrent to protect the family home. Worst of all for Joe, Rosie and their children is wondering which others of them have the disease. There is a fifty-fifty chance for each of his children that they will have the disease. If they don’t have it, the disease stops with them, but if they do, then their children will also have a fifty-fifty chance of having Huntington’s Disease. Other chapters follow Joe’s children’s lives. One of Joe and Rosie’s children is married, and his wife has just learned she is pregnant. One daughter’s is a ballet dancer and the other, a yoga teacher. Their youngest son is the one they worry most about, he works in a bar, gets in fights from time to time and might be using drugs. Some of the children choose to find out if they will develop Huntington’s, and others are happier not knowing. For such a sad story, the book ends on a gracious and hopeful note, just as Still Alice and Love Anthony did. There is no hope that the characters (or real people) who have Huntington’s Disease will get a reprieve, but the O’Brien’s are accepting of their fate, grateful for their family and friends, and most importantly, aware they are loved. After blubbing my way through Love Anthony by Lisa Genova last year, I had a feeling I would also need the tissue box close by when I read Still Alice. I was right. Sniff. Gulp. Still Alice is the story of Alice, a cognitive psychology professor at Harvard University, who is happily married with grown up children. Alice’s life is terrifyingly busy, as well as teaching, she travels to conferences, serves on exam committees, speaks publicly, has a social life, and finds time to run. She is also incredibly intelligent, to the point where if she was real, her friendships would be limited to people she works with. However, as a character, I liked Alice, felt as if I knew her and felt empathy for her situation. The first sign for Alice that something is wrong is while guest speaking at Stanford, when a word gets stuck on the tip of her tongue. Then she goes out for a run and gets lost a mile from home, in an area she knows as well as the back of her hand. Alice seeks medical advice but continues to suffer from what she calls memory disturbances. Her doctor runs a series of tests, and diagnoses her with early-onset Alzheimer’s disease. Alice is fifty. The chapters are broken into months, and document Alice’s memory decline over the next 18 months. Her decline is rapid. She begins with forgetting small things, then big. Sometimes she is completely lucid and at other times, she drives her family mad by asking them the same thing over and over again. Alice works for as long as she is able, but has to give up teaching when her performance starts to impact her students. There are times when she does not recognise her children. Alice’s family cope with her health changes in ways entirely suited to their personalities. Alice’s husband gets lost in his work, her son goes missing emotionally, one daughter, who is about to become a mother herself takes more and more responsibility for Alice, while her youngest daughter, an actress, is the one who is best able to connect with Alice emotionally as her health deteriorates. I read Still Alice over a couple of hours. The story educated me about Alzheimer’s disease, which is clearly a terrible, terrible disease, but I also happy to get to know Alice and her family while reading this story. I will probably seek out the movie of the same name soon, no doubt with a tissue box close by again. 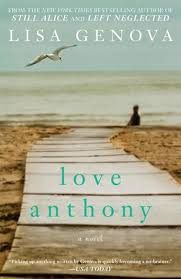 I blubbered for a while after finishing reading Love Anthony by Lisa Genova. All through the last chapter I had gulping, hiccupping sobs and big, hot, wet tears rolling down my cheeks. I was lucky enough to be home alone at the time so had a very enjoyable cry. Love Anthony is two women’s stories, which initially are quite loosely entwined. Both women live on Nantucket Island off Massachusetts, (as already mentioned in my review of an Elin Hilderbrand novel, I love reading stories set on this island, and I intend to visit one day). Both main characters also have enormous changes to deal with in their lives. Beth is a mother of three, who thought she was happily married until she received a card in the mail telling her that her husband was having an affair. Beth’s husband Jimmy moved out of the family home when she confronted him about his affair and in my opinion, Beth was better off without him. However, what I think was best for Beth would have meant the end of her story in the first chapter, so Beth continued on, mostly finding herself. The other main character in this book, Olivia, came to Nantucket to grieve the death of her son, and the recent end of her marriage. Olivia’s grief is further complicated by her struggle to understand her son Anthony’s purpose in life, as Anthony was autistic. Olivia’s struggles to communicate with and to understand her son are heart-rending. Beth and Olivia begin as ships in the night, passing each other in Nantucket so casually they are unaware of each other’s existence, even though their first encounter eventually changes both of their lives in the most wonderful way. Gradually, they become more aware of each other, as Olivia overhears a conversation Beth has with a friend in a supermarket queue, then Beth employs Olivia to take her annual family photos. Part of Beth’s finding herself involves returning to writing fiction, which she gave up when her and Jimmy’s children were born. When she learns that Olivia is a book editor, Beth asks Olivia for her professional assistance with a story she has recently started writing. Beth’s book is written from the perspective of a boy with autism. Reading the story is a gift for Olivia, who believes Beth’s story has come directly from Anthony. Gulp. Sob. Love Anthony has taught me about autism and the struggles of parents of autistic children without the subject being dumbed down, or the more unpleasant details being glossed over. I believe Lisa Genova’s best known book is Still Alice, which also features characters with specific medical conditions. I expect I will be seeking out Still Alice and any other books Lisa Genova has written very soon. If you’re a softie, read Love Anthony with a big box of tissues close by. If you live on Nantucket, you can buy your tissues at the Stop & Shop, which is where the characters in this book buy their groceries, along with the hordes of tourists who visit the island in summer. Please, please, please, let me be one of them one day.